Photo of the Pacific Ocean taken by Wilda Morris, in September, 2004. It seems to be in the nature of human beings to argue. Children may argue with friends over who got the biggest cookie or who gets to play with which toy. In some cultures teenagers argue with parents about how late they can stay out, and where and with whom. Co-workers may argue over work assignments. Friendships,love affairs, and marriages are sometimes broken up by arguments. One of the best pieces of advice I was ever give is that it is fine to disagree, but try to disagree agreeably. 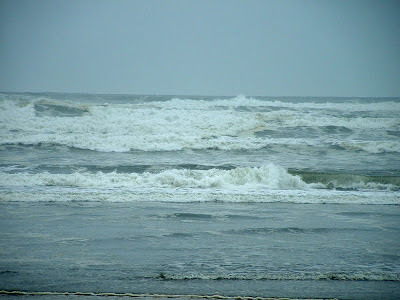 Though you may have argued with other people, have you ever argued with the ocean? Or with sparrows? William Marr is writing a whole series of poems about pointless arguments—not arguments with human beings, but with other elements of nature and with inanimate objects. These poems have powerful images as well as a rye humor. Marr agreed to let me print two of his argument poems for the April challenge. In case you are not familiar with Marr, I’d like to introduce you to this creative and original poet and artist. Marr was born in Taiwan and has published a total of seventeen books of poetry in Chinese, two books of essays and several books of translations in Taiwan, Hong Kong, and China. His two books of poetry in English, Autumn Window (1st ed. 1995, 2nd ed. 1996, Arbor Hill Press, Chicago) and Between Heaven and Earth (2010, PublishAmerica, Baltimore) are distributed at www.amazon.com. His poems are included in over one hundred anthologies, ranging from literary textbooks to special collections, and have been translated into more than ten languages. Most of Marr's poems are short(many of them considerably shorter than those below). Many are humorous, and some have such surprising endings they almost take your breath away. Marr is a past president of the Illinois State Poetry Society, and a member of the Poets Club of Chicago and the Kentucky State Poetry Society. He has edited and published several anthologies of Chinese and Taiwanese modern poetry, and also pursues other artistic interests including painting and sculpting. He has held several solo as well as group exhibits in the Chicago area, Beijing, and on the Internet. His Website at http://wmarr9.home.comcast.net/~wmarr9/bmz.htm contains images of his art work as well as selections from his poetry books. A scientist by profession, he has lived and worked in the Chicago area since 1970. As they say on television and radio, in the interests of fair disclosure, William Marr is also a friend. I have the privilege of being in two poetry groups with him, groups in which we critique each other's poems. NOTE: In the poem above, some lines should be indented, but blogspot does not allow indentations. Marr gave me permission to print the poem with all lines left justified. William Marr retains copyright to these poems. The challenge for April is to write an argument poem. Your poem may follow Marr’s pattern, and be about the pointlessness of arguing with an animal, bird, mountain, or whatever. Or maybe you would prefer writing about are argument with your parent, child, spouse, boss, or other person. Or maybe, like some of the Hebrew prophets, you want to argue with God. Be creative. You may write a formal poem or free verse. If formal, please specify the form. The deadline is April 15. Poems submitted after the April 15 deadline will not be considered. Due to formatting restrictions on the blog, all poems should be left justified. As much as I would enjoy a sparrow-shaped poem, I am unable to publish indentations, shaped poems or even extra spaces between words or phrases.